A US patent has been granted to a Kansas State University-developed “candy” that stimulates the growth, health and reproductive functions of cattle, bulls and other livestock. Jim Drouillard, professor of animal sciences and industry, discovered a specific combination of molasses, oilseeds and oilseed extracts that when heated and evaporated, formed a substance that improves absorption of specific omega-3 fatty acids. The substance contains desirable fats that elevate levels of specific omega-3 fatty acids in the bloodstream. The increases in omega-3 fatty acids can stimulate growth, improve immunity and enhance reproduction function and overall fertility in livestock that consume the supplement. 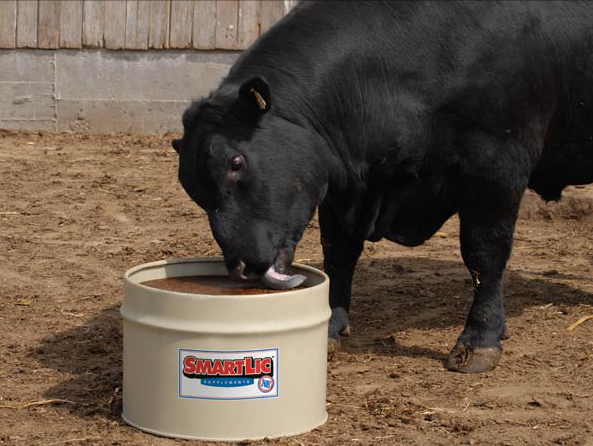 New Generation Feeds, a South Dakota-based company, has retained exclusive rights to the patented technology for use in its SmartLic brand of livestock supplements. The process is used in making the company’s HorsLic supplement for equines and FlaxLic supplement for beef and dairy cattle. The patent, “Product and process for elevating lipid blood levels in livestock,” is issued to the Kansas State University Research Foundation, a nonprofit corporation responsible for managing technology transfer activities at the university. Drouillard is continuing research on the combination by working to improve the fats’ resistance to bacteria in the digestive system.